In this interview, Stan Coutant talks about the history of the microphone and provides background information for vintage mic collectors. Based in Sierra Madre, California, Stan can be reached through his vintage microphones website, Coutant.org, which is a member of our Hall of Fame. I focus on broadcasting and music recording (studio recording) microphones, not so much home entertainment or movie making, although a lot of the microphones could be used for that. 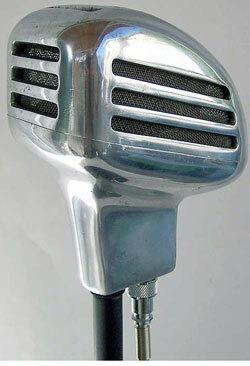 Collectors Weekly: What’s the story of the microphone? Poly-directional ribbon RCA Type 77-DX that was made during the late 40s. Coutant: In the beginning, radio was used for communication purposes only, like ship to shore, and when someone played music over the radio, people said nobody would ever want that. But eventually they came around, and a transducer was needed to convert acoustic energy (sound) to electric, so it could be sent over wires, and when radio came out over the air. A transducer is anything that converts energy from one form to another. Different experiments were made with various vibrating media, plates and carbon granules and other things that could be set in motion by waves. Eventually processes were developed where you could use a vibrating, thin metallic ribbon, a vibrating circular membrane kind of like our eardrum. You could use a coil of wire with a vibrating diaphragm in the center. That was one of the most popular techniques and still is, because when sound waves impinge upon the diaphragm in a magnetic field, it makes an electrical current that can go down the wire. A microphone is very much like our ears, it does the same job, converting acoustic energy to electric energy. When sound waves strike the eardrum it vibrates back and forth in patterns that match the original sound and that vibration pushes on three microscopic bones in the ear which push on the inner ear, which turns the vibrations into mechanical motions and then into hydraulic pressure. That stimulates the nerve endings in our ears and produces little electrical signals that go to our brain. Microphones work the same way. There are three basic types of microphones that are used professionally: moving coil, ribbon, and condenser. There are also others such as, crystal, carbon, and ceramic, but the sound quality is insufficient for broadcast or recording. One of the best known microphone manufacturers is a German company named after the owner, George Neumann, an electrical engineer who strove for years to get perfection in electrical recording. Accuracy is the key to getting that real-life sound, and that’s what he was able to achieve. His company, Neumann, produced some of the finest and most expensive mics in the world and was recently acquired by Sennheiser. Other current German manufacturers include Beyer, Schoeps, and the American manufacturers are Electro-Voice and Schure. There’s an Australian company called Royer. All these companies are still producing. RCA no longer makes mics; they quit doing that in the 1970s. Collectors Weekly: What’s the difference between the bulky microphones and the skinnier mics? Coutant: The big heavy ones with the grills are the older ones and some of them are pretty good. Their big drawback is they’re so huge and heavy that they can be very fragile. The old ribbon mics can be ruined simply by blowing in them, never blow into an old mic. The new, smaller mics are lighter weight, which makes them easier to set up in a studio, and they don’t obscure the face of the singer or actor. Broadcasters tend to use microphones that are more rugged and can handle abuse, especially in the field; where they handle their microphones a lot. Musicians generally don’t touch the mic, because it’s important there’s no handling noise. Performers are told never to touch the mic. The original mics were huge because they put big funnels inside, people thought you needed that funnel to get sound. In less than 10 years manufacturers figured out that you didn’t need to use a big funnel, all that was needed was a little piece, like the inside of our ears. The 1920s and 30s is when companies started making microphones that worked well, and in the last 70 years they’ve made a lot of improvements. Collectors Weekly: What are the charts on your site all about? Coutant: They show the mic’s frequency response, how well it can hear high notes, in-between notes, and low notes. Also, its sound acceptance pattern. Does it hear noise from one direction, two directions, or all around? Microphones have names: unidirectional, bidirectional, and omnidirectional. Omnidirectional mics are used when you want to capture all the sound in a room or area. Bidirectional picks up sounds from opposite directions; you can put them between two people who are talking back and forth, without also getting the background noise. And unidirectional is only from one direction, like if you’re on the sidelines at a football game and want to pick up the voices in the huddle, but not the cheering crowd. On talk shows like Leno, they usually have an old-looking microphone on their desk for show. In most cases they also have a modern mic overhead. The mics used above them are the shotguns, which only pick up the sound of the speaker. When you hear the crowd laugh, that’s coming from other mics called crowd noise mics. Collectors Weekly: What are some of your favorite manufacturers and mics? Coutant: I use different mics for different situations. My collection contains quite a few Electro-Voices, a Neumann, many Shures, and AKGs, which is an Austrian manufacturer, I also have some Audio-Technicas. Vince Lombardi was the coach of the Green Bay Packers and somebody at Electro-Voice fixed him up a public address system, you know like the megaphones these days. He was so pleased with it that he told the guy, “you’ve given me an electric voice.” So that’s the slogan they used, and they became very popular because of that publicity. Coutant: The big microphone society is called The Audio Engineering Society. They’re worldwide and have their annual convention this year in Korea. They’re like a world fair for audio. The society is made up of professionals still working in the industry plus some collectors. They’re the pros. Correction, Royer is an American company. Interesting article. What a great site! I’ve never seen so many mics. Thanks for the information. Does anyone know where I may acquire either an original or copy of one of the vintage (circa 1950-1970) RCA radio studio microphones? I recently acquired an RCA KU-3A and an RCA Varacoustic and am wondering if there is any way to tell what year the mics were made. i have a rca 77-dx microphone. what is the rough value? 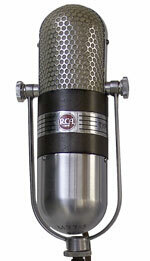 Jay Lucy: The easiest place to get the RCA mics are on Ebay. I guess you’re looking for the RCA 44 or 77 models, since they’re the most famous and synonimous mics associated with the RCA brand name. These were some of the most used studio mics in the 50’s, and you’ll find a lot of photos online with famous singers like Elvis, Nat King Cole, Frank Sinatra, as well as many famous radio DJs and announcers at the time. Randy McCauley: If your 77-DX is in great aesthetic shape and working, it will probably be worth between $1.500-2.000. The RCA 44 model is worth more. Almost always reaching prices above $2.000. “ ” It's a happy accident of playing records. Sometimes they sound interesting at the wrong speed.